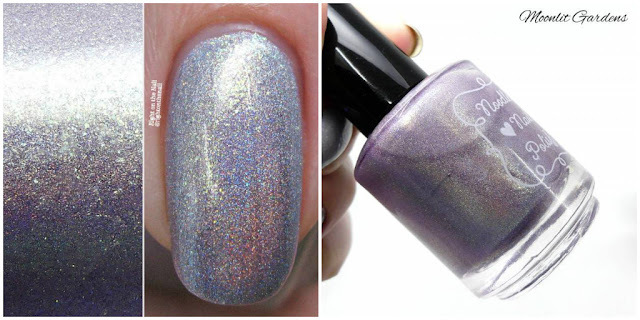 Up first is Awakening which is a dusty taupe crelly that leans purple with purple flakes and shimmer. When my family was visiting, this one received very high praise. It's one of those polishes that is "work-appropriate" but is still interesting. I ended up using 3 thin coats, but you may be able to get away with 2. It dried with minimal texture, but I always recommend that topcoat. The formula for the whole set was on the thinner side, but in a good way. There are a few indie brands that are just too thick for my personal preference, so this thinner consistency was welcomed, especially when dealing with crellies. I've made my love for grey polishes quite evident, so of course Bunny Trail is one of my top picks of the collection. It's a medium grey crelly with purple and pink holo glitter, and loads of iridescent flakes and glitter. The flakes sort of float in the background and lay completely flat on the nail. It dries with a little bit of texture from the glitters, but only 1 coat of topcoat was needed. I again used 3 coats for full coverage and it had that thinner formula as mentioned above. Natalie is the queen of glitter crellies, so of course we must get at least one of those per collection! Hippity Hop (cutest name!) is a white crelly with hot pink, purple, chartreuse, and light pink hexagonal glitter. I guarantee you will not get any issues with getting thin layers even with all the glitter. Usually polishes like these are very thick to keep the glitter suspended, but this has that same thinner formula. I've had no issues with the glitter sinking at all (this one or the one I have from the Winter Collection) and I've had these a few weeks. You can use 2 thicker coats or 3 thinner coats for full opacity (I chose the latter). It does dry with some texture, so I recommend a coat of Gelous + a coat of topcoat, or just 2 coats of a thinner topcoat. I ended up using 1 coat of a thick topcoat and that was fine for me. The glitter makes the removal a little tougher, so bust out that peel-off basecoat (I recommend this one) or use the foil method to make things easier. At first I thought the base for Lilacs & Lilies was pink, but I believe the copper and bronze flakes/shimmer was making it appear more pink on my nails. Either that, or it was just my skin that made me think it was more pink. Anyway, it's a light lavender crelly base with the copper and bronze additions. This one was more cream-like, which was why I definitely only needed 2 coats. Some light colors like these are streaky and/or have leveling issues, but I'm happy to report I had none of these issues. It dried quickly and had very minimal texture. Whoa, whoa whoa, stop the clock! 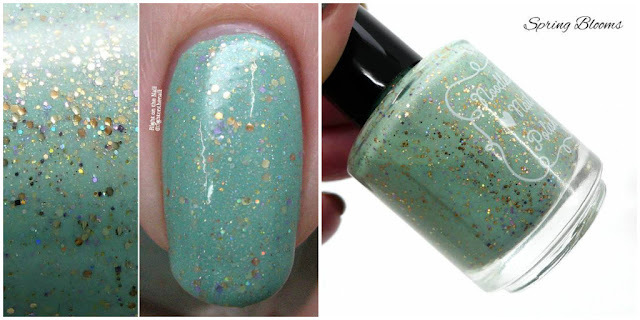 If you want someone to stop you on the street and ask you what polish you're wearing, then Moonlit Gardens is for you. It's a light purple linear holo polish with green to blue shifting shimmer. To my eye, it can definitely look gold in the background (you notice it more indoors, and in the bottle shots). It really shines outdoors, but you still get that holo effect indoors. 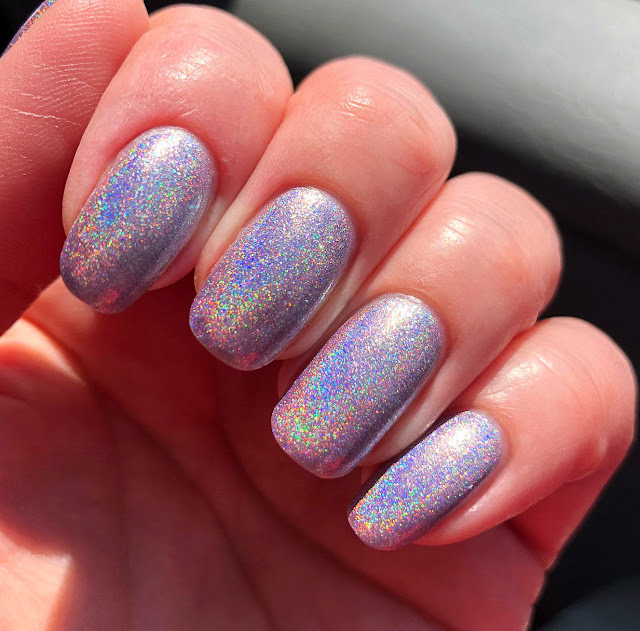 Usually holo polishes like these cost more, but this one is $9.50 just like the rest of them. This is another top pick from the collection. I used 2 coats for the photos above, and the formula was just like the rest of them. 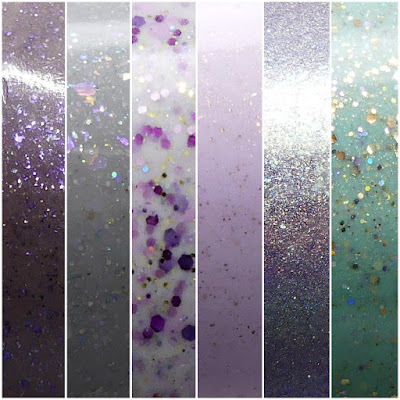 And last, but certainly not least, we have Spring Blooms which is a mint green crelly base with holo gold, purple, and copper glitter with a scattered holo finish. I think this one is the equivalent to Moon Glow from the Noodles Nail Polish Winter Collection (aka my favorite). The gold and copper really pops against the mint base and it's just a perfect pairing. Like Hippity Hop, this one dries with some texture, so follow my instructions from above. Despite being a crelly, I was able to use just 2 coats for this one. So there you have it! Natalie really knocked it out of the park again. She has such an eye for color combinations, and she continues to amaze me with these well-rounded collections. My top picks are Bunny Trail, Moonlit Gardens, and Spring Blooms, but you will not be disappointed with any of them. Again, these will be available on Saturday, April 14th at 5 PM EST. If any polishes happen to sell out, they will be restocked at a later date (yay for no Hunger Games restocks). Each polish will be sold individually for $9.50, or as a set for $52. You can find out more about Noodles Nail Polish on their website, Instagram page, Facebook page, and Facebook Fan Group.